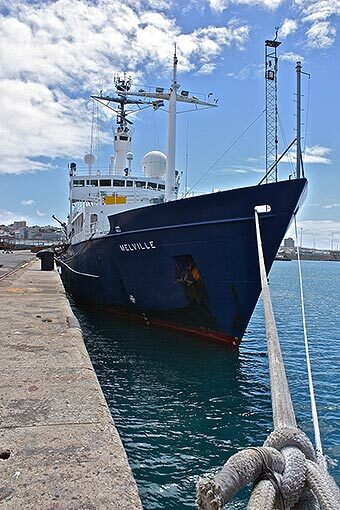 R/V Melville and her crew arrived in Port Elizabeth, South Africa a couple of days before our scheduled departure, and the science staff, from the University of Miami, Scripps Institution of Oceanography, University of Southampton, and the University of Cape Town came aboard shortly thereafter. The people were ready to go, but the equipment in this equipment-intensive science had not arrived. It was shipped in a timely fashion from Miami in two large containers, but they were not here. Where were they? Our technicians, who had arrived in Port Elizabeth last week to sort out and stow their gear, had been hearing conflicting reports as to the containers’ whereabouts ever since. Variously, it was stuck somehow in customs; it was on the truck, but the truck took a wrong turn somewhere; it hadn’t been released from the shipper; or something. And so we waited for it or for a straight answer as to why it wasn’t here. It’s not uncommon in this field for equipment to be lost, but that usually happens in the ocean, not on dry land. And so we killed some time getting to know one another and finding our way around the ship, particularly those students for whom this was a first-time experience. 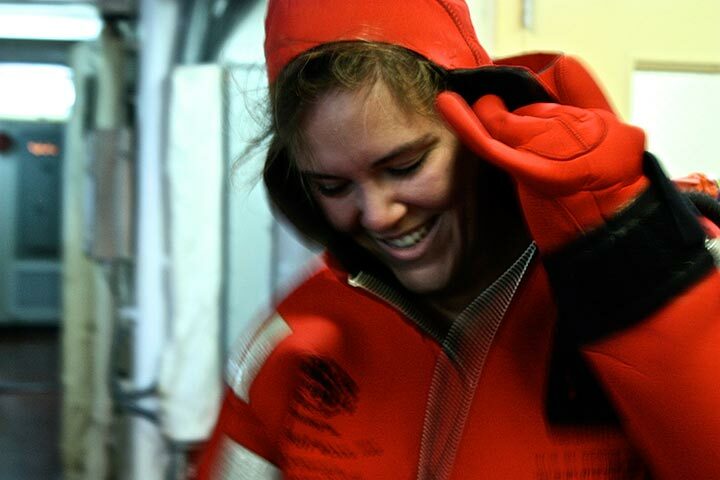 We held a fire-and-abandon-ship drill, followed by a contest to see who could don the survival suits fastest (28 seconds was the winning time). Meanwhile, the clock is ticking both on the per-day costs of the ship and the finite limit of Lisa’s cruise time. So while we wait, let’s talk about this current called Agulhas most of us had come from the other hemisphere to study. The first thing one needs to know is that the Agulhas is very fast. Mariners speak of a current’s set and drift, set being the compass direction toward which the current flows—the Agulhas sets generally south. Drift is the speed of the current designated in nautical miles per hour, or knots (you don’t say “knots per hour”). The Agulhas drift often reaches and sometimes exceeds five knots, or nearly six miles and hour, arguably the fastest current in the world. But mariners and oceanographers see currents from somewhat different perspectives, both of which apply to us since the science is conducted from a ship. For the safe, efficient operation of their vessels mariners want to know both set and drift, but they need concern themselves only with the surface of the sea, its movement down to the depth of their ship’s keel. The surface of the sea is vitally important to oceanographers as well, but they can’t stop there. The Agulhas, for instance, exerts its influence down 2,000 meters and more. The Oceanographer needs to consider—that is, to measure—the entire width and depth of the current. To accommodate the spectacular volume of water transported in a big current like the Agulhas, scientists needed to come up with a specialized unit of measurement. They settled on the “Sverdrup” (Sv), named in honor of the pioneering Norwegian oceanographer, Harold Sverdrup, who served as director of the Scripps Institution of Oceanography (Melville is a Scripps ship) from 1936 to 1948. One Sverdrup equals one million cubic meters of water passing a single point every second. 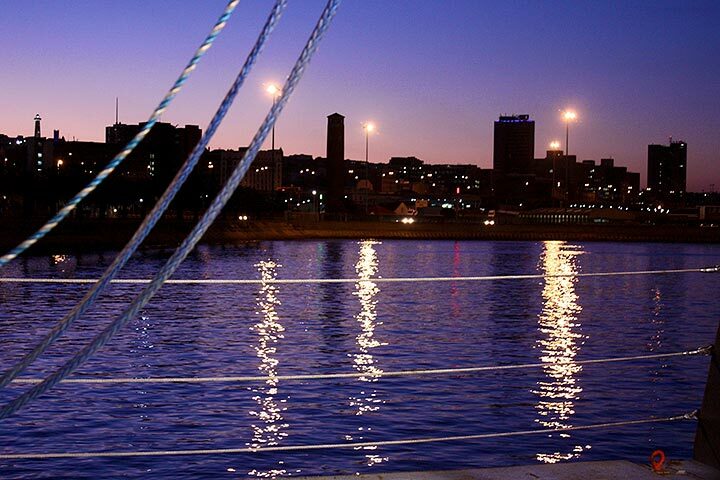 At certain points in the sweep of the Agulhas, the transport exceeds 100 Sv. All this dynamism carries serious ramifications for ocean circulation and, as we’ll see later, for climate, but perhaps most spectacularly for ships in the form of the infamous rogue waves. The rogue is defined in the Nautical Almanac as a wave more than twice as high as the “significant wave height,” or the mean of the largest one-third of the waves in any given set of conditions. But that cool language does no justice to reality. When wind blows against any current, it sets up relatively large, steep-faced waves distinctly different in character from wind-with-current waves. And when both wind and current are extreme, very large significant wave height is generated, and sometimes out of these conditions 100-foot monsters arise perfectly capable of sinking large ships. The Agulhas has been called the home of rogues, because the current is so fast and southerly winds often blow hard against it. Captain Dave Murline, passing through the main lab, stopped when his phone rang. Could this be the news we’ve awaited or more of the same vague excuses? We watched his expression for a hint. He snapped his phone closed. “It’s on the way,” he said. We had heard that several times before. But, sure enough, one of the two containers arrived on the wharf a half hour later. (We’ll need to return next week to Port Elizabeth for the second container.) The entire science party and members of the crew donned hard hats and swept into action, and in record time we unloaded tons of gear, anchors, floats, acoustic releases, chain, and all manner of oceanographic equipment. 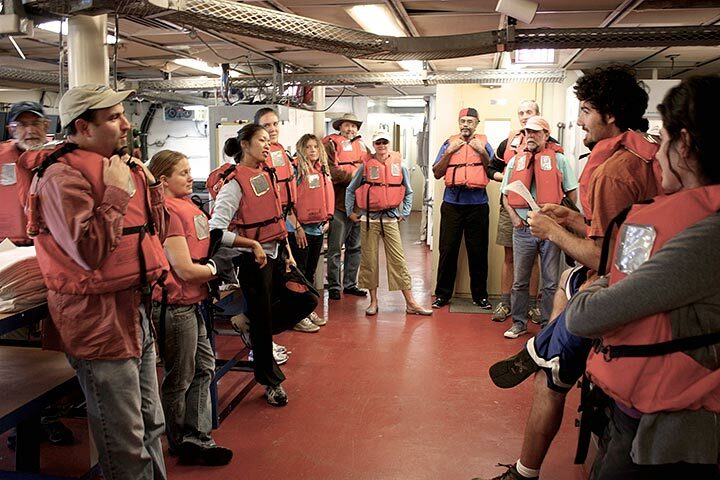 Two hours later, the stuff was stowed in the lab or bolted to the deck, and we were ready to go. I went up to the bridge to watch as we cleared the breakwater, the outer harbor buoy in sight. “Captain, I recommend a course of zero-eight-three when we come abeam of the buoy,” said Second Mate Jeff Sylvia at the chart table. The captain repeated the heading to the helmsman. And so we were at sea, the beginning of what we hope to be a successful survey of the Agulhas Current. The gentle roll felt good underfoot.